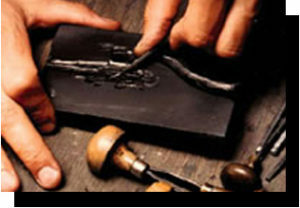 As in the past, hand engraved pieces of slate are used for the molds of the pewter figurine. After drawing the image, the engraver applies their artistry to the stone until the desired shape for the piece is created. Two molds must be created to provide a mirror image which will complete the front and back of each figure. 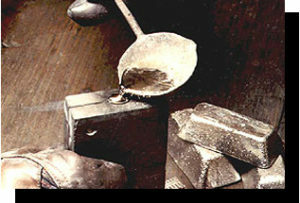 First molten pewter is poured into the feeding tubes of the completed mold. Since the molten pewter cools and hardens very quickly, a challenge of the design is to ensure the molten metal fills the mold completely before the pewter sets. In order to ensure the highest level of detail and subtlety in the figure being created, a tin alloy from a centuries-old recipe is used. 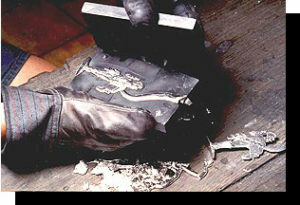 Once the molten pewter has set, the mold is opened almost immediately. Now the new casting is removed from the mold and carefully trimmed and prepared for the artist to paint. 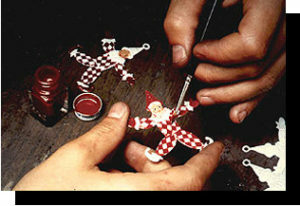 Each mold is carefully painted by one of several talented artists. Enamel paint is applied with special Rotmarderhaar (Red Martin Hair) brushes. These brushes, along with the skill of the artist, allow for the extremely fine detail that all Wilhelm Schweizer pieces are known for. Since each piece is hand painted by an individual artist, the colors from piece to piece may vary, thus making each piece unique. Any small imperfections that you might notice are a sign of their handcrafted workmanship. Each year, carefully selected individual pieces are added to the Wilhelm Schweizer Collection. Although this site shows painted pieces, many of these same pewter castings are available as unpainted pieces. Contact us if you wold like more information about the price and availability of unpainted pieces.